We were on Malta, a tiny island at the crossroads of the Mediterranean, within sight on a clear day of Sicily and Mount Etna, and we were confused. Since our first day on the island, Gary (my husband) and I had been experiencing generalized confusion. For example, we had been told that everyone spoke English—after all, Malta had been an English colony for over 150 years—but street signs were unpronounceable, and our taxi driver didn’t seem to understand a word we said. He replied to our frantic queries in something that sounded like a mixture of Arabic and Italian. And it turns out it was. Sort of. Maltese is a Semitic language, brought by Phoenician settlers 3000+ years ago, so it sounds vaguely Arabic. And because Italy has had such a pervasive influence on Malta—in part because of proximity, and in part because for decades the only television channels available were Italian—Italian words and cuisine are prevalent. But our linguistic confusion was superficial. Much more confusing were the temples, the fat ladies, and the cart ruts. 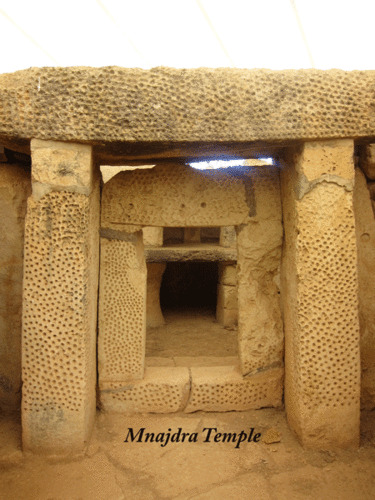 We had come to Malta to see the massive Neolithic stone temples, recognized by UNESCO as World Heritage Sites. Some of them date back 5,500 years—or maybe 10,000 or 12,000 years, depending on whom you believe. Ggantija, on Malta’s tiny neighbor island Gozo, is thought to be the second oldest temple in the world, after Göbekli Tepe in Turkey. It predates the pyramids by millennia. Some writers believe the Maltese temples are oriented to astrological alignments that existed 12,000 years ago, not 5,500—and might even have been built by extraterrestrials. And then there are the “fat lady” statues. Huge or tiny, pottery or stone, headless or with heads, the ancient fat lady statues have been found all over Malta. Usually, a short, pleated skirt modestly covers their obese hips and thunder thighs. Their balloon-like calves end in tiny pointed feet. A replica of one immense fat lady statue still guards the Tarxien temple. Originally 8 feet high, only the lower half has survived, nearly as wide as it is high. The 5,000-year-old original is in the National Museum of Archaeology in Valletta. The fat lady statues are peculiar, to say the least. Some have holes for the insertion of heads, which makes you wonder whether they had different heads for different occasions—or to represent different deities. But most peculiar of all is that they are called fat lady statues. Many of them are flat chested. They could just as well have been called fat man statues or gender-neutral. But people get ideas, and often these ideas have more to do with dogma than with observation. At one point, certain modern goddess-worshippers decided that Malta had been the center of a Mediterranean-wide fertility cult of the Earth Mother. Many things, including the curvaceous shape of the temples, were interpreted from a female-deity perspective. Maybe that’s why the statues were named “fat ladies,” even when they have no apparent breasts, or when the top half is missing. For example, one of the iconic fat ladies—this one a delicate, 4.7”-long pottery figure wearing an ankle-length dress, lying on its side—was discovered in a pit in Hal Saflieni Hypogeum. Hal Saflieni is a three-story-deep underground complex of halls and chambers carved out of rock, complete with lintel-topped doorways. It is the only excavated underground temple in the world and was discovered by accident by construction workers in 1902. They immediately hid their find and continued building a house over it. But truth will out, at least sometimes, even on Malta, and soon an archeological investigation began. Unfortunately, the field notes were lost before they could be published—along with many of the artifacts—so much that is known today is the result of conjecture, later excavations, and fantasy. The Hypogeum (the word means “underground” in Greek) resembles a subterranean temple, complete with 32 rooms of different sizes, some of which are elaborately painted with ochre or decorated with geometrical designs. The oldest level, closest to the surface, dates to 3600-3300 BCE (Before Common Era). The next level down dates to 3300-3000 BCE, and the lowest level, 35 feet below ground level, is dated at 3150 -2500 BCE. The underground complex includes rooms that have been named the Main Chamber, the Holy of Holies, the Decorated Room, and the Oracle Room, which produces resonating acoustical effects if you make very low toning sounds. There is a chamber in the lowest level that is reachable by seven stairs that end abruptly some distance above the floor of the pit. The official audio guide suggests that this bottom chamber with the seven steps ending in midair was a trap for grave robbers. Hmmm. The official audio guide also informed us that the Hypogeum may have begun as a sanctuary but was soon turned into a burial ground. The bodies of over 7,000 individuals were reportedly dug out of the dirt during initial excavations. According to this scenario, as the deceased Maltese filled up the upper level, surviving Maltese dug out more stone and dug down through the knee-high dirt and decaying bodies to construct more rooms and deeper levels for their dead. It doesn’t take long to realize the unlikelihood of this scenario. But never mind. It’s equally hard to imagine that the dead, who were so unceremoniously deposited in the dirt, would have been interested in acoustical effects, painted ceilings, and a Holy of Holies with an altar. But you never know. Anything seems possible on Malta. But back to the 5,000-year-old Sleeping Lady. The audio guide informed us that she represents a dead person, lying on her side on a carefully sculpted bed, and is proof that the Hypogeum was a necropolis. On the contrary, I thought she looked like a sleeping fat lady—and her presence in the underground sanctuary strongly suggests that the Hypogeum was used as a place of dream incubation. We know from classical sources that dream incubation (the process of going into a dark, isolated space such as a cave, under the supervision of specialist priests) was a standard practice in ancient times. People sought healing, guidance, or insight through contact with the Divine, achieved in a dreamlike, altered state of consciousness. When I did more research, I found that some experts do indeed think that the Sleeping Lady is neither dead nor a goddess but is, instead, engaged in dream incubation—and that the Hypogeum was an initiatic incubation temple. Either the official audio guide was a product of massive incompetence or it was intentionally trying to steer us away from a deeper understanding of the Hypogeum and the Sleeping Lady. At any rate, there’s an official story and they’re sticking with it. And then there are the prolific prehistoric “cart ruts” found on the island, notably at Naxxar, San Gwann, and Clapham Junction. Yes, cart ruts: series of more or less parallel, more or less deep, channels cut into the limestone bedrock, sometimes extending for a mile or more. They’re called cart ruts, and the official story is that they were worn by carts carrying stone from quarries to temples. But it is unlikely that that’s what they are, given that there’s no evidence of the wheel or cart in prehistoric Malta. Some ruts stop at the edge of cliffs; some run at an angle of 45°; others are anything but parallel; few are found in relationship to quarries and temples; and single ruts have been found in the water around the island. So why call them cart ruts? Is this just a case of mistaken nomenclature? Or it is another Maltese example of intentional misdirection? As I said, I’m not a conspiracy theorist, but on Malta it is hard not to become suspicious of the official line. The longer we stayed on Malta, the more confused we became. Finally, we simply gave up trying to figure anything out. Malta is a place to experience, not to analyze. And there are amazingly powerful places to experience—including Calypso’s cave, St John’s Co-Cathedral, with its over-the-top décor and gorgeous Caravaggios, and the paired Neolithic temples Hagar Qim and Mnajdra. In 2001, 60 large stones at Mnajdra were knocked down and some broken, possibly by vengeful Maltese hunters who had been ordered to removed their bird-blinds from the Neolithic temple walls. But that’s another story. Author's Note: Access to the Hypogeum is limited to 80 people per day. Although a few tickets are available the day before, it is highly advisable to reserve tickets online months in advance. Contact www.heritagemalta.org. For more information on dream incubation, read Peter Kingsley’s book, In the Dark Places of Wisdom. For an alternative view of Maltese prehistory, read Francis Xavier Aloisio’s Islands of Dream – The Temples of Malta – Hidden Mysteries Revealed.